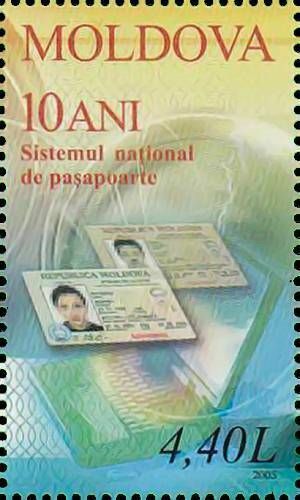 On 16 September 2005, the Post Office of Moldova (Poșta Moldovei) issued a series of postage stamps with the title 10th Anniversary of the National Passport and Identity Card System. The issue comprises three stamps on a souvenir sheet, with associated cancellation (postmark) and first day cover (FDC). The designer was Vladimir Rusu. The printing was performed by Tipografia Centrală, Chişinău. The Moldovan passports are issued to citizens of Moldova for the purpose of international travel. 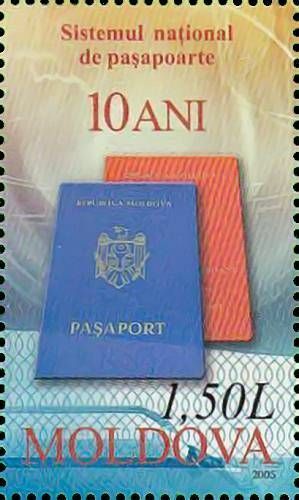 The passport is issued by the State Enterprise and Information Resources Centre 'Registru' and by Moldovan foreign representations abroad. The validity of the passport is 7 years. For children under the age of 7 years the passport's validity is 4 years. 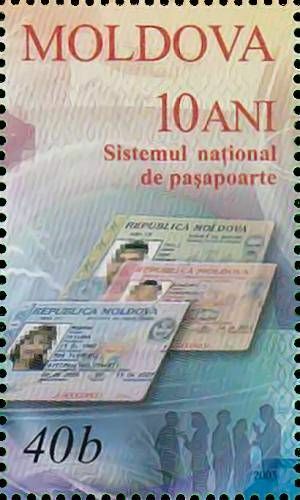 Since 1 January 2006 Moldovan citizens have the possibility to hold two passports simultaneously, providing a written request has been submitted to local passport office. Read more.. This article uses material from the Wikipedia article 'Moldova_passport', which is released under the Creative Commons Attribution-Share-Alike License 3.0.